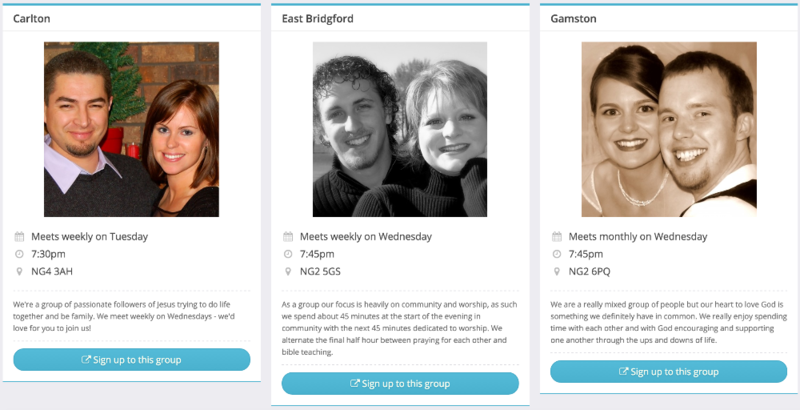 In addition to helping your members to sign up for small groups through My ChurchSuite and Connect, you can also enable small group sign-up through an Embedded list of small groups in your website. 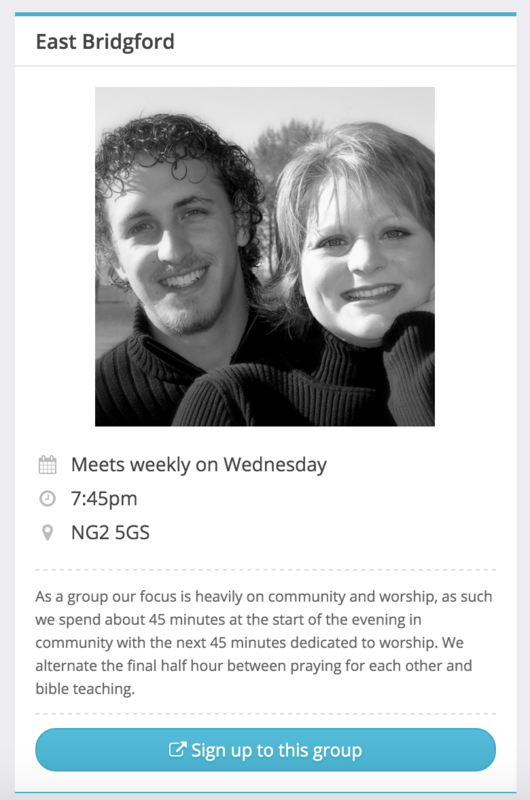 This can be especially useful for allowing non-church members (those not yet in your Address Book and those members unable to use My ChurchSuite) to sign up for your church's small groups. This article will explain an overview of the sign-up process and the workflow within ChurchSuite. We'll then demonstrate the process for enabling small group Embed sign-up on a group-by-group basis. We also recommend reading the related article below, which explain the process of how to Embed small group lists and maps in your website. Small Group Embed sign-up functionality works on a group-by-group basis, allowing you to enable the sign-up feature for some groups but not others; while still retaining the ability to show your active, and even future groups in your embed group list and/or map, if you wish. This is useful where you want to present the small groups that are running in the life of your church, even if they are not yet open to sign-ups currently, rather than displaying an empty list to those visiting your website. You can specify a Notifications email address that is notified when a new sign-up has been submitted; perhaps a Small Group Pastor or Administrator. Multiple email addresses can be added - simply separate each with a comma. You can also set whether the sign-up's contact details are partially obfuscated in notification emails - perhaps for privacy. Each small group has its own unique group sign-up page. Select "Go to group page" to view the page and see the unique URL, which can easily be embedded into your communications; perhaps to promote a particular newcomer group, enabling those who may not yet be in your Address Book or those without My ChurchSuite access to be able to easily sign up to that small group via the group's sign-up page. Once small group lists and/or map are embedded in your website, people can browse your groups and select a group to view more information about it. If "Sign-up through embed" is enabled in the group's settings (and group sign-up is open, and there are spaces available), they can sign up using the sign-up form within the group page. The group page also includes a visual progress indicator showing the group capacity and available spaces. If the group is full, or the sign-up period is not currently open, the group remains visible in the embed list, but a message is displayed and the "sign-up" button is disabled. The group embeddable group list and map can be configured to filter by site (for multi-site churches), the Day [the group meets], and Small Group Tags, allowing you to customise your embed lists and map to display just those groups you wish to show, and also to make it easy for your website visitors to filter lots of groups to find just the one that's right for them. 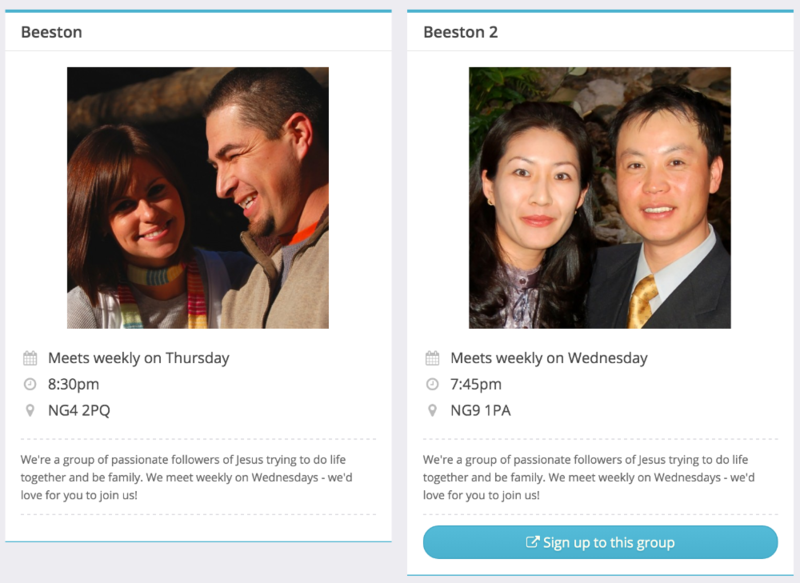 You can even create multiple group Embeds for different parts of your website, perhaps showing just newcomer-friendly groups in the newcomer section of your website, while showing courses running as small groups in the discipleship section of your site. 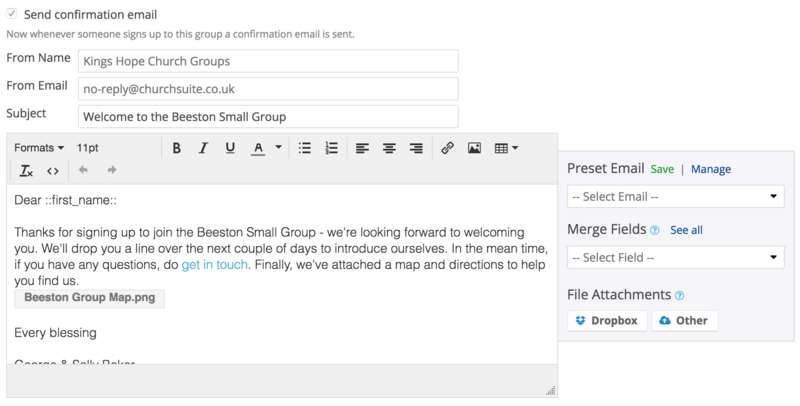 Configuring the look and feel of your Small Group Embed list (including, adding a customisable messages to the sign-up page, and defining global sign-up notifications) is covered in the related support article, "Embed small group lists and maps in your website" (see below). For multi-site customers, 'unmatched' successful sign-ups are added to the "pending" section for the same Site as that of the Small Group for which they've signed up to - the contact is flagged as being part of their Small Group's Site and is visible in the 'pending' section of the Address Book to those users. The sign-up process involves people completing the sign-up form on the group page. ChurchSuite will attempt to match the sign-up details submitted to an existing person in your database. A clever matching algorithm uses first name, last name, email and mobile to find a match. If matched, the person contact is joined to the small group member list, a "Joined group" Key Date is automatically recorded, and a Note is added against the contact to indicate the sign-up originated through the embedded small group list. Importantly, ChurchSuite employs "reCaptcha" (web robot) checking to protect churches from being 'spammed' by non-genuine sign-ups. For sign-ups where the person cannot be exactly matched in your Address Book, and who pass the robot checking, they are added to the "pending" section of your Address Book. The unmatched sign-up is still joined to the group, but with a clear visual indicator in the group member list that indicates that the new contact needs to be reviewed and 'set active' in the Address Book. A Key Date and Note are recorded against the 'pending' contact as with 'matched' contacts. In the Address Book module, in addition to "Active" and "Archived" contacts, you will see a "Pending" section where unmatched sign-up contacts can be reviewed before being set active in your Address Book. After reviewing a "pending" contact - perhaps to check a duplicate contact isn't being created, to check the legitimacy of the sign-up, or to assign them to a different site (for multi-site churches) - they can then be 'Set active' (or archived or deleted if they are not legitimate for any reason). Setting a contact active has the effect of changing their status from pending to active in the Address Book. Until a "pending" contact is set active, they cannot participate in any other functionality within ChurchSuite i.e. they can't be processed through a Flow, or appear in Smart Tag results, or be linked to a Giver profile or added to a Rota or be able to use My ChurchSuite, etc. Their functionality is restricted to only being visible in the small group member list. 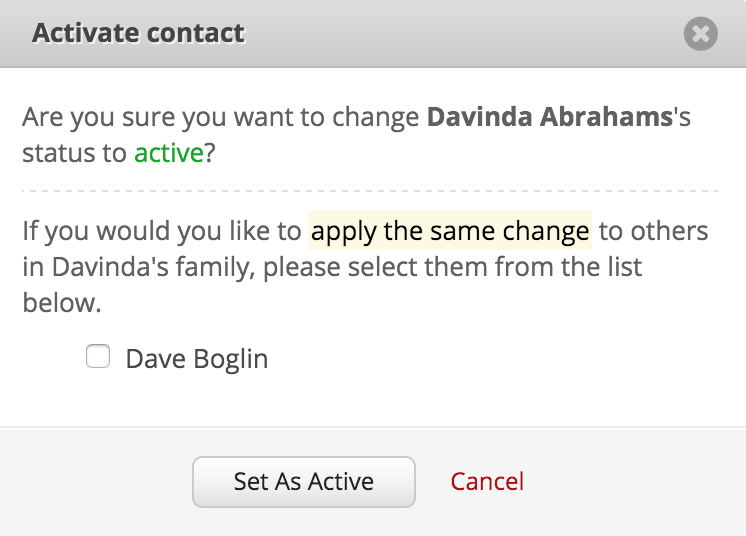 When setting a pending contact active, if ChurchSuite detects group "sign-ups" from other family members (i.e. 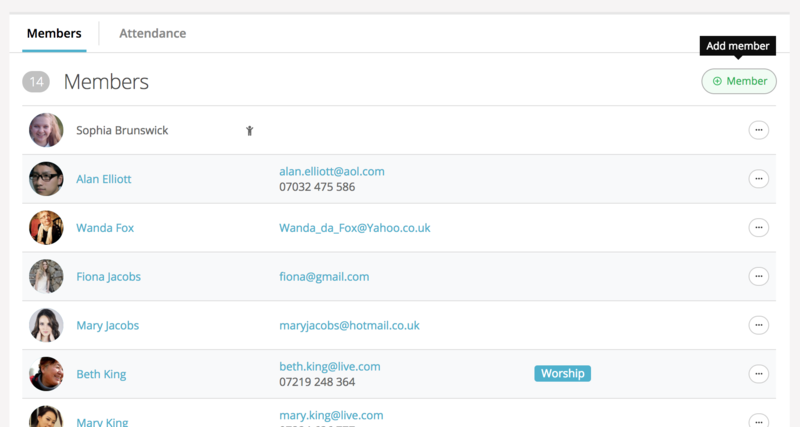 where contact details match), ChurchSuite will give you the option to set those related pending family members active too. Small group Embed sign-up is managed on a group-by-group basis; allowing you to enable sign-up on some groups but not others, if you wish. In "Small Groups" > "Groups", select each group in turn and click "Edit group". Scroll down to the "Visibility" section. To set a group visible in Embed, tick "Show in Embed". Additionally, to allow sign-up, tick "Sign-up through Embed" - this option is only visible if "Sign up through Group page" is first enabled. Next, where sign-up has been enabled, add the date range for when you want the sign-up period to be active for (this can be open-ended), and optionally set any group capacity. The "Member List" setting is only relevant to groups visible in My ChurchSuite (Embed "sign-ups" cannot ever view a group member list until they are given access to My ChurchSuite), so this setting can be ignored for Embed purposes. You can also set whether new sign-ups are added to the group with an 'active' status, or with a 'pending' status requiring approval from a leader first. Remember to save any changes made to the Small Group before navigating away from the page. 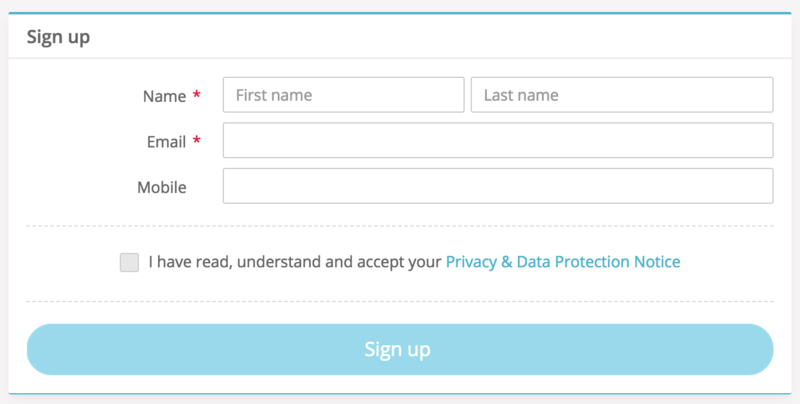 Repeat the above process for each Small Group in your list that you want to enable "embed sign-up" functionality for. A great way to group similar types of group together is by using Small Group tags. You might create tags based on oversight clusters, geographic areas, group focus; in fact anything you like! There's no limit to the number of tags you can assign to your groups. Once tagged, you have enormous flexibility with your embed filtering, to provide content-relevant group lists in your website; making it even easier for people to find the right group and sign up. So if you have a youth section of your web site, why not just embed your youth small group list by tagging your youth small groups and selecting that youth tag filter in the embed code customisation. It's really simple to do! With the Small Group capacity setting you can optionally cap the number of sign-ups a group can receive. Once a group is full, no further sign-ups will be permitted via My ChurchSuite or Embed. 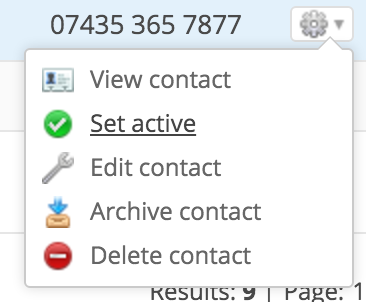 Note that active Address Book contacts can still be manually added to the group in ChurchSuite, allowing you discretion to override the capacity cut-off. But also, Small Group leaders, or those roles with 'group edit' functionality enabled for My ChurchSuite, can also add members to their group, in effect overriding the group capacity.